There are several kinds of biopics. In the bottom are the ones that approach their subject in a superficial, simplistic manner – things like Not Without My Daughter (1991) and Patch Adams (1998) come to mind. Then you have the middle-of-the-road stuff, the ones that don’t quite make it, like 2004’s Ray. And then you have the stuff that cuts through the crap and makes its own statement, based on real lives and situations but taking the liberty to reinterpret them: Martin Scorsese’s exploration of the mob through the eyes of wiseguy Nicholas Pileggi in Goodfellas (1990) does just that, as well as Terrence Malick’s poetic rendition of Pocahontas in The New World (2005). But there’s another more elusive category of biopic, the ones that have all the right moves but don’t necessarily reinvent the wheel. The Imitation Game is one of those films. The Imitation Game is about the work of Alan Turing, the British mathematician who, at the height of World War II, was recruited by the government to crack the code of a German cipher machine called Enigma (Turing and his group of analysts were eventually successful in decrypting the messages, effectively giving the Allies a chance at defeating Hitler). The film is pretty much a straightforward spy thriller, with much of its running time devoted to its race-against-time formula… and it works exceptionally well. It hits all the right notes at precisely the right times, pushing the viewer along with suspenseful sequences, well-timed surprises, and the right balance of drama, humor, and emotion. It’s a solid piece of cinema, even if it brings nothing new or special to the table. But The Imitation Game scores extra points because it’s also about Turing’s life: The bullied young outcast who yearned to be accepted; the repressed homosexual who couldn’t express his desires for fear of prosecution; the eccentric genius whose intelligence was also his curse. In a way, it’s a movie about secrets – the ones he had to unravel and the ones he kept from others. The title refers to one of Turing’s tests on machine intelligence, but it also applies to a multitude of things: In tackling Enigma, Turing advanced existing Polish technology to create a device that could replicate or “imitate” the German contraptions. He would devote much of his later research to the idea of computers being able to think or “imitate” a human being. He proposed to a woman in order to keep appearances, trying to “imitate” the life of a heterosexual man (he eventually called it off). And he was indicted for indecency in 1952 and sentenced to chemical castration in lieu of jail – a forced and foolish attempt by the Brits to make gay men “imitate” the approved sexual behavior of the era. In essence, this is a film about a man trying to come to terms with himself. I like the fact that Graham Moore’s script takes the time to flesh out these details, notwithstanding any dramatic liberties he may have taken with the material. 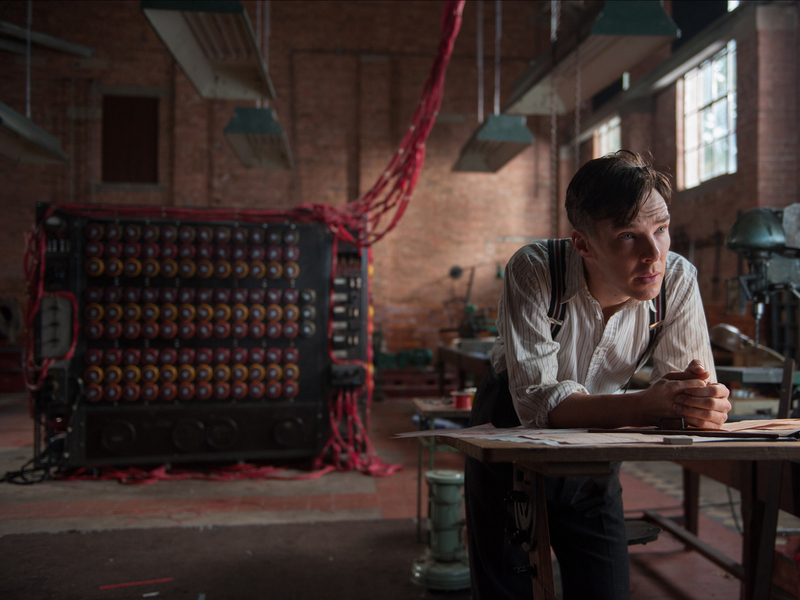 And it really could’ve gone either way – as I’ve said, The Imitation Game is rather prosaic in its delivery. But what ultimately makes the film so fascinating to watch is Benedict Cumberbatch. His performance is pretty much indelible – he nails the pain, confusion, and arrogance of a misunderstood loner. When his best friend and co-worker Joan Clarke (Keira Knightley) suggests he try being more amenable to his team, he awkwardly brings them apples and tries to tell a joke. It works, and as the crew eventually warms up to him, Cumberbatch captures the confused satisfaction of an outsider making real human connections. In scene after scene, he lets you see into the mind of a genius. You can virtually hear the cogs whirring. In the end, you may forget the more conventional aspects of The Imitation Game – the German bombing montages, the planted spies, the sudden aha! moment that finally breaks the code – but you won’t soon forget Cumberbatch. He simply rocks. Good review! Benedict was great! Even Keira did a good job!